Testing for genetic diseases is a relatively new frontier and one in which social workers can help clients navigate the ethical and social challenges of choosing whether to get tested and learn the results. She nervously describes her family history. Because of Huntington’s, she grew up watching her strong, hard-working father slowly deteriorate over 15 years to the point that routine tasks became a struggle and he could no longer walk without help; the hallmark movement symptom called chorea had taken its toll on his body. Also, his usually mild temperament became marked with periods of rage and valleys of despair. Elizabeth watched how this genetic disease impacted not only her father but also her mother, who served as his primary caregiver, and her younger brother, who also is at risk of developing the condition. She wants information about genetic testing and needs it immediately, as she has just learned that she is pregnant. As a social worker managing a large predictive testing program for neurodegenerative diseases, I receive these types of calls, e-mails, or even texts at least weekly. Each person has a story to tell, and they often want quick answers and wonder why they can’t just get a simple blood test. Many who seek information about their genetic fate, whether for neurodegenerative diseases such as Huntington’s disease, Alzheimer’s disease, or amyotrophic lateral sclerosis or any of the hereditary cancers, do so armed with their own family story, their own fears, and their own hopes. Genetic testing brings to light challenging questions that social workers must grapple with personally and manage professionally. The questions start at the beginning. Just how much genetic information do we really want to know about ourselves? What is the best way to learn this genetic information? Many believe that genetic testing is appropriate when treatment options for a particular genetic disease are available, but what if the disease currently is incurable, such as Alzheimer’s, Huntington’s, Parkinson’s, and many cancers? This issue has been discussed in the Huntington’s community for nearly 20 years, since the gene mutation was first identified in 1993. The genetic test can indicate whether a person will develop Huntington’s later in life. The question is, would you want to know this information? An early study conducted in 1993, shortly after predictive testing for Huntington’s became available, proposed a model supporting the position that, in the absence of any treatment for this disease, an individual loses little by delaying a confrontation with reality and may stand to gain greatly in psychological preparation by delaying or even avoiding genetic testing altogether (Bloch et al, 1993). Now, the use of consumer-driven websites can provide quick and inexpensive access for clients to spit into a tube and then wait to learn their genetic risks with no social work support or genetic counseling required. There are three main reasons why individuals decide to pursue predictive testing for adult-onset disorders such as Huntington’s. The primary reason often involves a change in their life situation, such as planning to get married or start a family. The second reason is when the stress of not knowing whether they have inherited a faulty gene starts to outweigh the potential stress of knowing. Pursuing predictive testing can help relieve the uncertainty of what looms within their DNA; yet, using the Huntington’s predictive testing as a model, there are few follow-up studies that demonstrate whether an individual experiences relief in knowing. The third reason involves needing to plan. Patients generally want to make sure they have the typical insurances (eg, life, disability, long term care) in place; career and/or educational plans may need to be altered; and so-called bucket list items may be pushed to the forefront. However, after studying almost 20 years of presymptomatic testing for Huntington’s disease, it has been found that the majority of individuals who say they want presymptomatic genetic testing so they can plan for their future never end up doing any significant planning (Hagberg, Bui, & Winnberg, 2011). I am often asked whether I would pursue genetic testing if an inherited adult-onset disorder ran in my family. After more than 20 years in practice, I still get caught off guard by this question. What would I do? Should I share this with patients and their families? Is it important? Why are they asking? There are no right or wrong decisions about testing; it is a highly personal choice. It is known that individuals who are not in a state of crisis, whether physical, emotional, or social, often will better manage the testing process. When someone wants to shorten the normal testing process, it’s important to find out why, as we have found that coping with the results may be more difficult in these instances. Patients and families who undergo a thoughtful, educational, and supportive process for presymptomatic testing appear to have better outcomes (at least from my clinical practice), particularly if they are found to carry the gene for a specific disease. It’s difficult for patients to appreciate or understand this until after the fact. Rarely do patients express regret over genetic testing, though it does happen. If individuals pursue testing of their own accord, instead of feeling pressured by a new spouse or other family members, then living with the result often can be easier to manage. A positive testing result can have different meanings depending on the genetic disease. As Huntington’s is an autosomal disorder, only one allele needs to carry the mutation in order to manifest the disease. If individuals inherit this gene mutation, then at some point in their lives, they will develop the disease. Nothing currently can help stop the underlying disease progression, but primary symptoms can be treated and quality of life maximized. Patients who receive a positive result often need at least six to 12 months to adapt to their new genetic knowledge while finding a way to make this information part, but not all, of their lives. For other adult-onset diseases that aren’t autosomal disorders, genetic testing results can provide clues to patients’ futures but often not direct answers. This ambiguity in the meaning of results can provide some relief but also the potential to instill more anxiety. The concept of personal autonomy is one of the guiding principles of biomedical ethics and a major issue when considering genetic testing. Each family member who is at risk of developing an inherited disease has a right to know or not to know his or her genetic risks. Therefore, it is important to understand the impact that one person’s testing can have on others in the same family. A case illustrating the quandary of personal autonomy recently challenged our team. A woman in her early 30s was at risk of developing Huntington’s. She was married and had a 1-year-old child conceived through in vitro fertilization with preimplantation genetic diagnosis to ensure the child wouldn’t be at risk of developing Huntington’s. This young woman wanted to have a second child without using in vitro fertilization and instead wanted to pursue predictive testing to discover her gene status. We recommend that patients bring a support person for the testing process. However, she did not want her husband to know that she was pursuing testing, nor did she want to have anyone else accompany her. As a clinic, we struggled with her right to autonomy vs. our serious concerns of the impact of her spouse not knowing what she was undergoing. In particular, what would happen if she had inherited the gene? However, when presented with the choice to have a companion with her during testing, she opted against it. With the explosion of genetic information and knowledge now available to clients, the challenge of trying to keep abreast of the latest findings can be daunting. 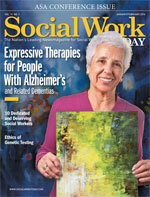 Social workers should focus less on the specifics and more on the big-picture issues. For example, reviewing a simple list of the pros and cons associated with testing and encouraging a client to reflect on them can help clients decide whether to pursue testing. • may cause the client to feel regret about taking the test. The issues of employment and medical insurance coverage have become less of a concern with the 2008 passage of the Genetic Information and Nondiscrimination Act. This federal law protects against discrimination based on presymptomatic genetic information. In particular, employers may not use genetic information when determining eligibility for employment, job placement, or promotions. Also, health insurance companies may not use genetic test results to set eligibility or premiums, and predictive genetic information cannot be considered a preexisting condition. However, the law doesn’t provide protection against life insurance discrimination or long term care or disability. The employer protection also is limited to companies with more than 15 employees. In my experience, most clients have difficulty understanding that learning they are a genetic carrier is a far heavier burden than they currently can appreciate. It is important to emphasize that once testing is done, it can cause feelings that all hope is gone or life is over. • assuages the feeling that not knowing has outweighed the knowing. Another helpful approach is to ask clients to think about how their lives will be different by finding out more about their genes than most of us know. In terms of presymptomatic testing for Huntington’s, up to 80% to 90% of individuals at risk of this disease have opted not to undergo testing (van’t Spijker & ten Kroode, 1997). Viewing your social work responsibilities as being educational, nonjudgmental, and neutral can be vital when the issue of whether to pursue genetic testing is at question and when helping clients understand that genetic diseases affect an entire family and that their own immediate testing results can ripple across the family. Simple shock is perhaps the most common reaction to confirming carrier status, regardless of the disease. A majority of clients start genetic testing convinced that they will receive bad news. In the reverse situation, when clients think they are just going through the motions because they don’t believe they carry the gene mutation and then discover that they do, their grieving process can be protracted. Anticipatory grief can become the new normal for gene carriers, especially depending on how they experienced the disorder in their family. How was the disease discussed, if it was discussed at all? How did the disease impact the affected family member? Is the gene carrier similar to the affected family member in terms of looks or temperament? This information can play an important role during the anticipatory grieving cycle. By pursuing testing, clients give up the uncertainty of their genetic fate to either a specific result or news of a greater likelihood of developing a specific disease (or not). Yet now they are presented with a new uncertainty in terms of “knowing the future” and wondering when symptoms may start to manifest. A 2008 study of mental health and quality of life after genetic testing for Huntington’s suggested a good psychosocial status of gene carriers until the first symptoms began to occur (Licklederer, Wolff, & Barth, 2008). The first two years after testing appear to be the most challenging. Most individuals report that the emotional impact of testing lessens as more years pass, even as the potential for disease onset begins (Hagberg et al). Those genetic carriers who appear to get stuck in their grieving and experience significant problems in coping may experience chronic PTSD. The frequency of PTSD has not been thoroughly investigated, though one study examined women three to six months after BRCA1 and BRCA2 genetic testing related to the chances of developing breast cancer and found that 25% of the mutation carriers experienced PTSD (Hamann, Somers, Smith, Inslicht, & Baum, 2005). The principle of nonmaleficence, or the duty not to harm others as it relates to genetic testing, often comes up concerning testing of minors or those under age 18. Various professional organizations’ protocols in the United States indicate that genetic testing of minors is appropriate only if there is treatment available that should be started while the child is still a minor. The controversial issue of testing a child for adult-onset cancer has been examined in some studies. Parents and medical providers often will disagree whether a child should be tested for an adult-onset disorder. Many medical providers believe it could do more harm than good, while the parents may believe they are making a critical decision for their child, as they do daily. It also has been suggested that the common policy of not testing children results from geneticists imposing their values and beliefs about what is best for the child and the family (Sharpe, 1993). Hence, both the principles of nonmaleficence (do no harm) and beneficence (do well to others) often can appear to collide when the issue surrounds genetic testing of minors for adult-onset diseases. Concerning Elizabeth’s story: She started the genetic testing process, wanting to expedite it because of her pregnancy. She only told her mother about the testing, and a longtime family friend accompanied Elizabeth to her appointments. During the testing, the clinic staff followed both principles of helping others and doing no harm by supporting the standard protocol but shortening the time in between clinic visits and respecting Elizabeth’s desire to terminate the pregnancy if she was found to be a carrier. Ultimately, Elizabeth learned that she would not have the same genetic fate as her father, and she went on to deliver a healthy baby girl, Faith. — Amy M. Chesire, LCSW-R, MSG, works in the movement and inherited disorders unit of the HDSA Center for Excellence at the University of Rochester in New York. Bloch, M., Adam, S., Fuller, A., et al. (1993). Diagnosis of Huntington disease: A model for the stages of psychological response based on experience of predictive testing program. American Journal of Medical Genetics, 47(3), 368-374. Hagberg, A., Bui, T. H., & Winnberg, E. (2011). More appreciation of life or regretting the test? Experiences of living as a mutation carrier of Huntington’s disease. Journal of Genetic Counseling, 20(1), 70-79. Hamann, H. A., Somers, T. J., Smith, A. W., Inslicht, S. S., & Baum, A. (2005). Posttraumatic stress associated with cancer history and BRCA1/2 genetic testing. Psychosomatic Medicine, 67(5), 766-772. Licklederer, C., Wolff, G., & Barth, J. (2008). Mental health and quality of life after genetic testing for Huntington disease: A long-term effect study in Germany. American Journal of Medical Genetics, 146A(16), 2078-2085. Sharpe, N. F. (1993). Presymptomatic testing for Huntington disease: Is there a duty to test those under the age of eighteen years? American Journal of Medical Genetics, 46(2), 250-253.
van’t Spijker, A., & ten Kroode, H. F. (1997). Psychological aspects of genetic counseling: A review of the experience with Huntington’s disease. Patient Education and Counseling, 32(1-2), 33-40.